Serialized Labels | | Industrial Marking Services, Inc.Industrial Marking Services, Inc.
Serialized Labels - Industrial Marking Services, Inc.
Serialized labels can be printed on a variety of substrates such as polycarbonate (or plastic), anodized aluminum, vinyl, polypropylene, and polyester. Anodized aluminum and polycarbonate labels are probably the strongest and most durable materials. 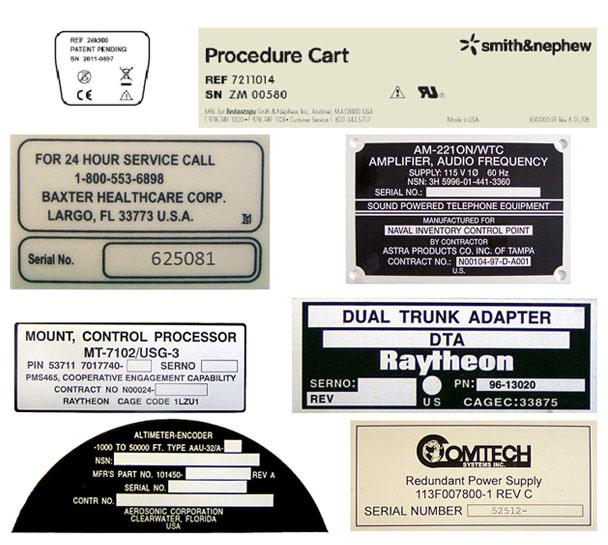 Unlike paper label products, aluminum and polycarbonate serialized labels are waterproof. They can also withstand repeated impacts, abrasion, exposure to ultraviolet rays and most corrosive chemicals. Our team at Industrial Marking Services, Inc. can help you choose the material that best meets your company’s requirements for serialized labels. The different methods of printing serialized labels include screen printing, hot stamp printing, thermal transfer printing and digital printing.